It was a gorgeous day for the Bainbridge Island Climate Change Education Event! The goal was to educate the attendees about climate change and the City's role in meeting the challenges of greenhouse gas reduction and preparing for change. The event combined tabling from a number of organizations, followed by several short presentations. Approximately 50 people turned out for the speakers which included State Senator Christine Rolfes, Mayor Kol Medina, Deputy City Manager Morgan Smith, Senior Planner Christy Carr and Climate Change Advisory Committee member Derik Broekhoff. 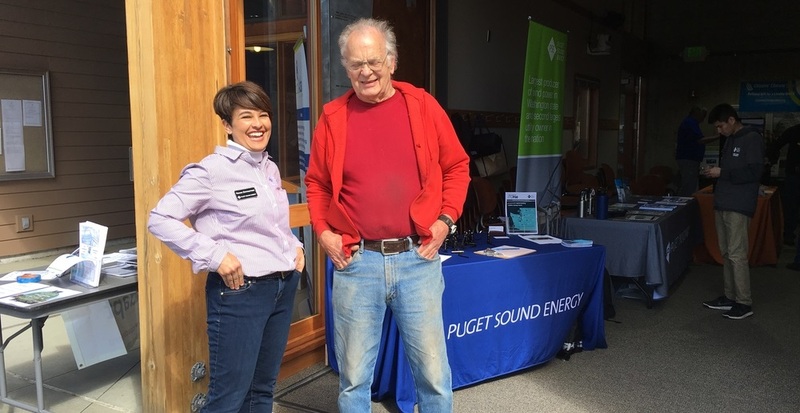 Puget Sound Energy had two tables at the event: one to highlight our renewables programs, and the other to introduce our effort to reduce our carbon footprint 50 percent by 2040. “It was a great opportunity to highlight to the community how PSE is assisting the island in reducing its carbon footprint,” noted Karen Brubeck, PSE Outreach Manager.